Dr. Steven Cooperman, Los Angeles; sale, Sotheby's, New York, 9 May 1989, lot 26 (acquired by the present owner). Franoise Cachin will include this painting in her forthcoming Signac catalogue raisonn. 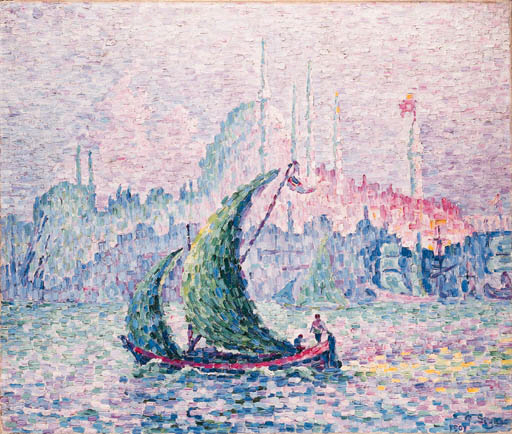 In 1907, Signac travelled from Venice to Constantinople by train in the company of the painter Henry Person. Signac was enthusiastic about both the country and the people, noting in his sketchbook "I have seen things and men, both admirable and new, something which is rare!" (quoted in Signac, exh. cat., Muse du Louvre, Paris, p. 80). He was also dazzled by the "shrouded northern light against a background of Oriental color. One thinks somewhat of London, Rotterdam, or Venice. Above all, it is Turnerian" (quoted in F.Cachin, Paul Signac, Milan, 1971, p. 95). However, the contrast of the swirling dark green and blue tones on the sail in the foreground against the graduating blues and pinks of the Sulemanie Mosque, has created a dramatic effect, rarely associated with the exacting technique of pointillism.